Yohei SUZUKI is one of the youngest directors in this year's program, but his films have already been screened at the well-known CREAM Yokohama festival for Arts & Media. Treading a fine line between documentary and experimentalism, Suzuki's films develop a dark attraction enriched by black humour. An experimental reconstruction of adult video shoot catastrophes, this film presents a variety of weird characters and situations. 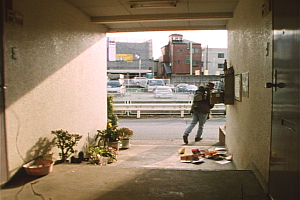 In his unique, cool style combining experimental film and documentary, SUZUKI follows various characters in their everyday life, creating an atmosphere of ever growing tension.